Kazakhstan's parliament approved a constitutional amendment Friday that would waive term limits for President Nursultan Nazarbayev, allowing the longtime leader to seek to stay in office indefinitely. The amendment, introduced by lawmakers to a package of political reforms proposed this week by Nazarbayev, is subject to the 66-year-old leader's approval. It was not immediately clear whether he would sign it into law. 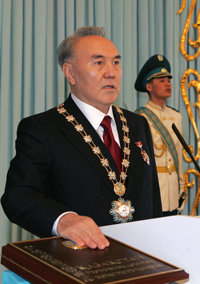 Nazarbayev, who has resisted democratic reforms during his 17-year rule and was re-elected with 91 percent of the vote in a 2005 election that international observers called flawed, is barred by the existing constitution from seeking a new term in 2012. On Wednesday, he proposed a package of political reforms that including shortening the presidential term from seven to five years - a change that would take effect after he is due to step down - and strengthening parliament's powers. The two-chamber parliament overwhelmingly approved his proposals Friday, but introduced additions including the amendment that would waive term limits for Nazarbayev. It would not apply to future presidents, who would be limited to two five-year terms. Ermek Zhumabayev, head of a legislative committee responsible for the proposed amendments, said lawmakers approved the term-limit waiver because of "the historic role of the first president in the development of our state ... and the need to complete economic and political reforms that have begun." Approval of the waiver would deepen Western concern over democracy in Kazakhstan, an oil-rich Central Asian nation Nazarbayev has led since before the 1991 Soviet collapse. Nazarbayev has sought to balance relations with Russia, China and the West. Kazakhstan has bid to chair the Organization for Security and Cooperation in Europe, a major trans-Atlantic security and democracy body, in 2009, but the OSCE put off a vote on the bid in December due to the country's failure to meet its democratic standards. Nazarbayev's own proposals included strengthening parliament by giving it a say in forming the Cabinet, which is now formed by the president alone. If the amendments take effect, the president would have to seek lawmakers' approval for his choice of a prime minister, who in turn would have the right to nominate ministers. The amendments would also increase the number of seats in the two-chamber Parliament from 116 to 154, with 98 to be filled by voting for political parties rather than individual candidates. Currently only 10 parliamentary seats are chosen on a party basis. The proposals were seen as part of Nazarbayev's preparations for a power transfer in 2012. Strengthening Parliament poses little risk for the Nazarbayev and could be a way to retain political influence once he steps down. Parliamentary elections in 2004 produced a legislature without a single opposition lawmaker, and in an effort to ensure the next legislature remains loyal to him, Nazarbayev last year strengthened his party by merging it with his daughter's. Nazarbayev has brought stability and relative prosperity to nation of 15 million with market reforms and Western investment in the vast energy sector. But Kazakhstan has been shaken in the past two years by the slayings of two vocal Nazarbayev critics, which opposition leaders said were politically motivated.